My sister who works at the Ala Moana Center Old Navy store in Hawaii is now mocking me about my blog and tweeting. About a month ago she sent me (and a whole bunch of family members) an email message saying that they were having a BFF sale and it was a crazy sale with all kinds of discounts and such and to spread the word to whoever. So I figured what the heck and I posted it to my blog, which automatically created a tweet about it. Not thinking anything more about it because they mostly ignore me in any Old Navy (they know I’m not going to buy anything) I just went about my day. A week or so later I was looking over the stats for that post and noticed some links coming in from Google on the keywords “Old Navy BFF” so I did the search and found out that my post comes up as the second non-paid for link on Google. So I told my sister that I get better search placement than Old Navy does. To which she was like “whatevers” which is her typical response to any “computer stuffs” that I ever try to talk to her about. Fast forward to today’s mocking email. So Mr. I get so many hits bragger….get the word out on this..
ALL WOMEN’S CLEARANCE MERCHANDISE (stuff marked down with red stickers) are ADDITIONAL 50% OFF the lowest clearance price. Women’s clothing only. Also, we have A TON OF WOMEN’S TANK TOPS, SHORTS, SLEEVELESS ITEMS AND MENS POLOS FOR $1.99!!!!! (CORRECTION:$2 event is only from 10/16-10/19) With the additional 50% off in WOMEN’S MERCHANDISE ONLY that makes the items only $.99 for the women’s tanks and sleeveless!!! ADDITIONAL 50% OFF IS ONLY AT THE ALA MOANA STORE AND IS ONLY ON WOMEN’S MERCHANDISE…WHILE SUPPLIES LAST!!! 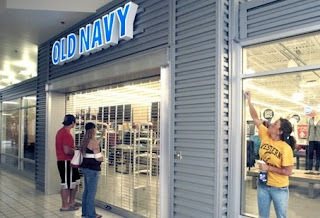 OPEN AN OLD NAVY CREDIT CARD AND YOU CAN SAVE AN ADDITIONAL 10% OFF THE ALREADY MARKED DOWN PRICES!!!! But it is crazy busy right now already and it isn’t even advertised. For the record I never said I get plenty of hits to my blog, I said that I had a better ranking then they did for that search. Ok, so for you geeky types out there, I don’t get a whole lot of hits or readers at this blog so I’m not saying that it is the most popular thing in the world. And I do know that it is more a testament to the fact that that particular combination of keywords is what got the good search placement and may not be the most searched combination for Old Navy stuff. BUT, we’re talking about sibling rivalry here so lie, cheat and steal are all good in love and war, right? PS. If you do find yourself taking advantage of the sale, don’t forget to tell the cashier that ParkRat sent you. It won’t get you anything but it will drive my sister nuts! Hahaha. « Just like Nibbits only BETTER!